The most exciting model coming to the Gwatney Mazda of Germantown showroom in the very near future is the all-new Mazda3. Our team of product experts has been fielding a lot of calls from potential buyers inquiring about the pricing and performance specs for the 2019 Mazda3 since it was revealed at the Los Angeles Auto Show in November. The latest updates from Mazda have revealed that it will start delivering the 2019 Mazda3 in March of this year. Initial numbers for the coupe and sedan will be low at first, so anyone interested in owning or leasing it should act quickly. Contact a Gwatney Mazda of Germantown representative as soon as possible. Mazda already has one of the most-respected engine lineups in each segment of the automotive industry in which they compete. For the new model year, the base version of the 2019 Mazda3 will get a major upgrade in performance. Under the hood of the 2019 Mazda3 will be a naturally aspirated version of the SKYACTIV® 2.5-liter, four-cylinder engine. This is a huge leap in power – especially when compared to the previous 2.0-liter, four-cylinder power plant which tops out at 155 horsepower. It is unclear if Mazda will offer a turbocharged engine for the 2019 Mazda3. The new Mazda3 will have an automatic transmission attached to the new engine on most trims, except for the top-end model that retains the manual gearbox. Depending on the choices a Gwatney Mazda of Germantown customer makes, upper trims of the Mazda3 can have an upgraded stereo system equipped as well as genuine leather and a heads-up display. 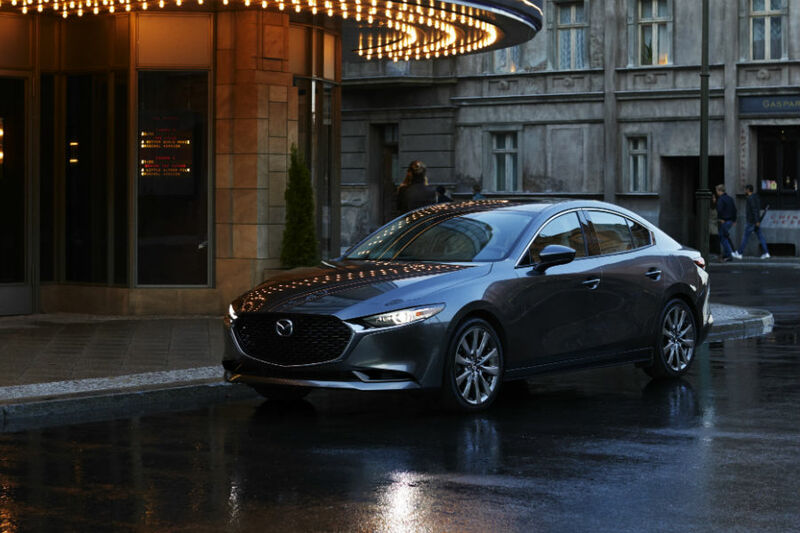 Of course, the 2019 Mazda3 will feature compatibility with the Apple CarPlay™ and Android Auto™ suites of applications. The 2019 Mazda3 carries a starting price of $21,895 for the sedan and $24,245 for the hatchback. At the other end of the spectrum, sedan buyers will need to have $29,795 with the hatchback’s top-end model having a price of $28,795. These prices don’t include taxes, fees or destination costs. Buyers can start the pre-ordering process with Gwatney Mazda of Germantown today by calling, 833-241-6312. This entry was posted on Wednesday, January 23rd, 2019 at 9:24 pm	and is filed under Mazda3. You can follow any responses to this entry through the RSS 2.0 feed. You can skip to the end and leave a response. Pinging is currently not allowed.